It’s been more than two months since lil’ Ms. GJG started school and I still cannot believe I have a preschooler! My day to day has been quite a challenge adjusting to a schedule that revolves around dropping off and picking up my daughter to and from school. We decided to enroll lil’ Ms. GJG second semester of school year 2012-2013 because we see how much she loves playing and learning but often times would shy away with kids her age. She’s also the one who showed interest when she had her trial session so we were sold. Lil’ Ms. GJG during her trial class. I have to say it’s not only her that is slowly learning the basics of schooling and socializing. As her mom, I am also slowly re-learning along with her. I’d like to write excerpts and lessons based on Robert Fulghum’s book All I Really Need To Know I Learned In Kindergarten but I’ll save then once Gabbie officially is in kindergarten. For now I’m a posting this photo which is also from Robert Fulghum’s book AIRNTKILIK just to give you an idea. I was one of the many parents who’d wonder why some parents decide on enrolling their kids to school at an early age. Well up until you’re in a certain and particular stage of motherhood and parenting, you can only be a spectator and a critic of others. I am guilty of that. I now foresee myself as a soon-to-be stage mother, soccer mom, a PTA committee perhaps even the president of a parent organized association of my kids’ school. Whatevs. That’s my future as a mom, good luck to me. Anyway, I was anxious and nervous for Lil’ Ms. GJG’s first day of school. I was anticipating what she’d feel and how she’d take everything that’s new to her. To my surprise she did pretty well, didn’t even look for me nor cried. The moment she stepped inside their classroom she was taken with the bright colors and the energetic, fun and happy people she’s with. My heart was semi-broken because I felt like she has forgotten me as I was hoping she’d look for me or at least cry. Am I a bad mom for wanting her to feel that way? No, but I am a selfish one at that. On the other hand the competitive side of me was cheering with glee knowing that my baby girl is independent and all grown up. Glad that every dismissal time she still looks for me in a pool of yayas and moms and gives a gleeful ‘hello’ as she waives her hand at me, my heart melts with happiness. Her first on stage performance. She did well. We are proud parents. Here are some of the things I’ve learned being a mom of a preschooler that I have come to apply for myself. Follow the rules. While others say that rules are made to be broken, I say rules are made to be followed. 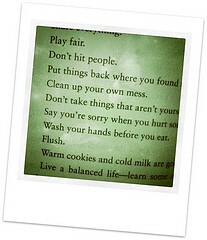 Simple instructions and rules are just a way of keeping life in balance. Check and balance lang yan, if there weren’t any then I guess the world would be more chaotic than it is. Time is of the essence. Just because lil’ Ms. GJG’s school is 5 minutes away from our home doesn’t mean I have the luxury to wake up late and leave the house 5 minutes before class time. It pays to have an allowance of time so you can leisurely do things you need to do and still have a free time to do the things you want to do. You’re never too old nor too young to learn. Should I elaborate further? As cliché as it may sound but we do learn a lot everyday. It may not be that obvious but we do. Through interactions, through other people, through old folks and even through our kids. I believe there is wisdom in most things. Be nice to everyone. This has always been one of my mottos in life. We are all connected in this circle of life one way or another. Kindness is something we should freely and openly give to others just like smiles. You’ll never know, your polite gesture or kind words might just make someone’s day. Don’t take it personally. Just like any institutions, school like family is the basic foundation in which our children learn how to express themselves and slowly get the sense of being. So if you’re given a time out or you’re actions result to such consequence I say take it. Take it all in and learn from it. Teachers and mentors are there to help you learn and cultivate skills you never thought you have or can do so don’t take it against them if you think they’re giving you a hard time. After all, nothing great ever comes easy. Haaay, I have a lot of musings ever since lil’ Ms. GJG started school. I am also very sentimental about it because soon I’ll realize she’s off to a big school and then college! But I don’t wanna sulk into the idea yet, for now I’m enjoying being her driver and yaya. I’m cherishing this moment and stage in our lives where school is easy, fun and exciting. Oh, I envy you. How I wish I can be my son’s driver and yaya too. 🙂 I would really love to bring and pick him up at school. Oh, I know how you feel! I felt a little bad too, when my son stepped into his classroom for the first time and forgot all about me.. 🙂 BTW, where does your little girl go to school? I’m thinking of switching schools for J and would like some feedback on other learning centers. 🙂 Thanks!